5 Ways to Have a Better Week, Starting Now! It's never too late to restart your week. Use these 5 daily healthy practices and over time you will start to notice stronger and healthier hair and body. 1. Start and end each day with an 8 oz glass of water with lemon or lime. and structured water to hydrate your body at the cellular level. Hydration at the cellular level helps your skin and hair to shine strengthening from the inside out. Lemon in your water is cleansing for the body and lemons provide some basic vitamins needed for healthy hair and body. Being hydrated boosts your immune system which reduces stress leading to peace of mind. When your body’s organs have strong regenerated cells you feel better overall and you are guaranteed to have a better week. Lemon & lime essential clarify oily, lifeless hair, impart sheen and renew. Try Young Living Essential oils of lemon or lime as your therapeutic food grade essential oil and Dr. Brown’s Healing Water structurally enhanced water. 2. Meditate or practice yoga morning and night. 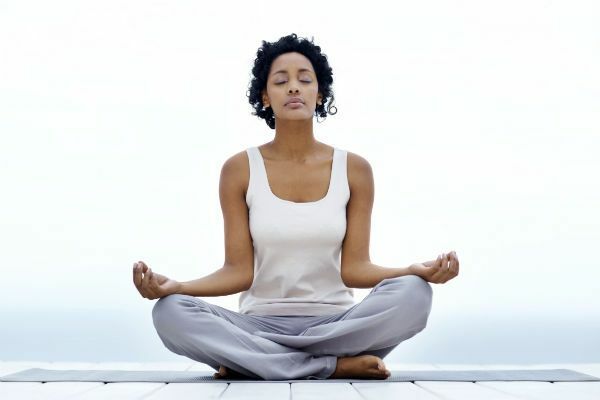 Mediation gets the body and mind balanced, clear and focused so you can flow through your days with more ease. I like the 5 Rites. Use 15-30 drops of organic grapefruit essential oil in 1-2 oz of organic sunflower oil and rub into your skin neck down to start your day. Try the same with organic lavender essential oil at night and then research other essential oils, meet with an aromatherapist or holistic practitioner for varied regimes to enhance your daily experiences. 3. Treat your scalp and hair at least once a week. Warm your organic oil – 1 oz of coconut, sunflower, safflower or grapeseed and add 15-30 drops of a calming or sensual essential oil like lavender, ylang ylang, roman chamomile, cardamom or 1 tsp of ayurvedic neem powder. Warm oil treatment in the scalp allows for the heated oils to penetrate deeper into the follicles, repair from the inside out and provide more moisture for better hair growth. For a more empowering uplifting experience in hair and body try german chamomile, geranium, rose or lemongrass or a combination of and apply to your scalp. If you don’t feel you have time for this – just put the oil, essential oils and some spring distilled or structured water in a spray bottle and use as a daily refresher. 4. Soak your feet mid-week for 10 minutes. Use dead sea salts, Himalayan salts or Epsom salts. Use the same essentials from your scalp and hair treatment. Foot soaking pulls out toxins from the body that can weigh you and your hair down. Soaking also provides relaxation and hair grows better and faster on a relaxed body. For your feet, soaking softens heels and allows for more fluid movement. Increase your daily intake of green leafy vegetables like spinach, lettuce and brussel sprouts and vitamin C while decreasing your intake of caffeinated drinks that increase pitta dosha in your body. In the ayurvedic excess Pitta dosha in the body is a leading cause of hair loss. Pitta dosha is one of the three bio-energies in the body and it is all about fire energy. Pitta Dosha controls digestion, decision making and metabolizing our sensory perceptions. Too much fire in the body will lead to hair loss because it dries things out quickly. It reminds us to allow for leisure time and do things in moderation. Eat healthy 6 days and gorge 1 day a week to satisfy cravings. When your body gets to be hydrated and detoxed you feel better. When you meditate and do yoga you keep a balanced mind and are more at peace which makes your hair grow better. Treating and massaging your scalp will have positive benefits for your mind and circulation stimulates growth and cognition. Pure high quality essentials oils are delivered into the skin in 3 minutes and into the cells of your body in 30 minutes for internal healing. Soaking releases the negative energies of a day so you can be more present. Last but not least, your diet will determine how good your week turns out to so eat your greens, beans and leans then treat yourself to a junk food day the same day weekly. Following these simple tips from the natural, holistic and ayurvedic will definitely help you to have a better week! Happy Healthy Hair and Body. For more useful tips on your health, hair, and body-- visit my blog, The Holistic Hair Healer.